Here's the solution to define the IE 10 or Internet Explorer 11 as the default browser in Windows 8, 8.1 and Windows 10! 1. Use and define IE 10/11 in Windows 8 and 8.1 as the default browser! 2. Why and when should use the IE 10 / 11 as the default browser! 3. Download the IE 10 or IE 11 browser for Windows-8.1 or 8! Please start in Windows 8 / 8.1 the Internet Explorer 10 or 11 in Desktop-Mode. To start the Internet-​​Explorer in Desktop-Mode, use the shortcut Windows+R and the command iexplore (... see Image-1 Arrow-1)! In MS-IE please click on the Settings Symbol (... see Image-1 Arrow-2) and select the option "Internet Options" (... see Image-1 Arrow-3)! After restarting the Windows Internet Explorer get the message whether it should be used as the default browser. If you answer this with yes, the MS IE 11 and IE 10 is again the default browser in Windows 8 or 8.1. Use Internet Explorer 10 or 11 as the default browser in Windows 8 and 8.1 (define)! will not work with the external browsers. Windows-8 - FAQ-128: Use Internet Explorer 10 or 11 as the default browser in Windows 8, 8.1 and 10 (define)! Why is ie 11 NOT supported on windows 8? 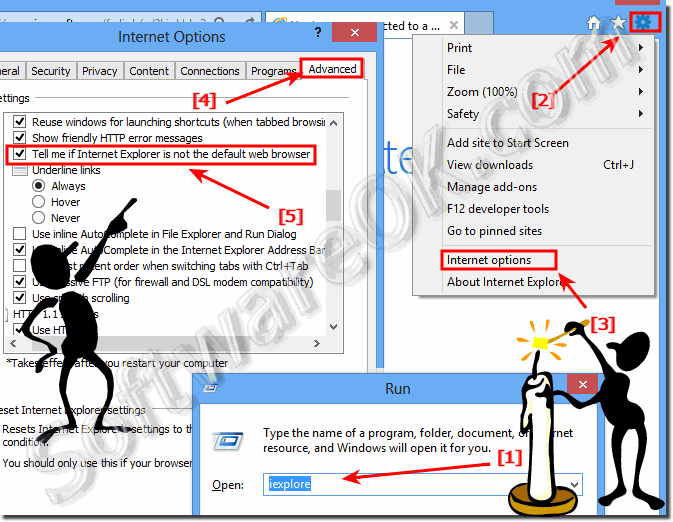 How to make internet explore 11 default brower in windows 8.1? HOW TO MAKE INTERNET EXPLORER DEFAULT USING THE REGISTERY? How to make internet explorer 10 the default browser using the regestery? How to make ie default browser in windows 8.1 explorer 11? Download internet explorer 10 32/64 window 8? Set explorer 11 as default? Set ie 11 as default browser in win 10? How to make ie 11 my defolt browser on windows 10? Howto make ie11 my default browser in Windows10? How to make ie 11 default in windows 10? How do you set a default browser on IE 11? How to make internet explorer 11 my default? What can i use instead of ie 11? How to make ie 11 default browser in win 10? Set ie 11 as default browser in windows 10? Ei 11 default browser windows 10? How to make ie 11 as default browser? How to set ie 11 as default browser? Use internet explorer 10 instead of 11? How to set ie11 as default browser? Making ie 11 default browser on windows 8? How run explorer 10 on windows 8.1? Can I use Internet explorer 10 with Windows 8.1? Use internet explorer 10 and 11? Internet explorer 11 to default on windows 8? Windows 8.1 no internet access 128? Set Explorer as Default Browser? Internet explorer 10 for windows 8.1? What browser should i use with windows 8.1? What is the IE default browser in windows 8.1? How to use internet explorer 10 instead of 11 in windows 8.1? How to get internet explorer 10 instead of 11 windows 8? Change to internet explorer 11 default browser for Windows 8.1? Make internet explorer default browser in ie 11? How to make internet explorer 11 as my default browser in windows 8.1? Use internet explorer 10 on windows 8.1? How to make internet explorer 11 default web browser? Windows 8.1 internet explorer default browser? How to enter explorer browser as default for windows 8.1? Make internet explorer default browser win 11? Set internet explorer 11 to default 10? Use both internet explorer 10 and 11? Internet explorer not using 64 bit defaulting to x86 windows 8? Internet options disabled in windows 8.1? Why use internet explorer 11? Can internet explorer 11 be used in windows 8? How to make internet explorer 11 default browser? Internet explorer options making internet explorer my default browser in windows 8.1? Internet explorer options making internet explorer 11 my default browser in windows 8.1? Making internet explorer my default browser for windows 8.1? Internet explorer 11 default browser? How to install internet explorer 10 in windows 8.1? Explore 10 or 11 to default browser in Windows-8.1? Internet explorer 10 download for windows 88? What browser to use for win 8.1? Windows 8 - should i use ie , 10 or 11? Default browser in windows 8.1? What internet explorer should i use for windows 8.1? How to use internet explorer 10 instead of 11? Install internet explorer 10 instead of 11? Windows 8.1 use desktop Internet explorer as default? How to make ie 11 default browser in windows 8? How do make IE 11 my default browser in windows 8.1? Win 8.1 ie 11 advanced internet options which should be used? How to run internet explorer 10 instead of 11? How do i get internet explorer 10 instead of internet explorer 11? Make IE 11 as my default browser? How to set IE 10 as default instead of IE11? How to use explorer 10 by default in windows 8? What default browser should i use? How to make ie 11 default browser? Run internet explorer 10 instead of 11? How to make internet explorer 11 the default browser? Make internet explorer default browser 11? Use explorer 10 instead of 11? How to make internet 11 default browser? How to use internet explorer 11 as default? Use explorer as default browser? Set as default browser internet explorer 11? Make internet explorer 11 my default? How to make internet explorer on defalt browser on windows 8.1? Make internet explorer 11 default browser? How to run Internet Exploerer 10 instead of 11? Installing internet explorer 10 instead of 11? Use internet explorer as defult browser?